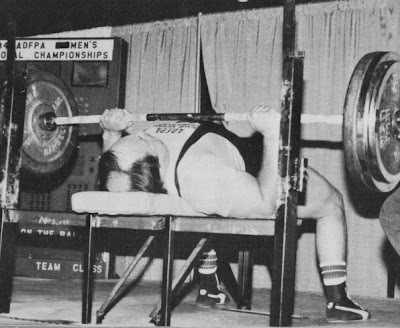 There are many reasons for our fascination with the bench press. It is a great upper body developer. It is also a relatively easy exercise to do as it is not as taxing on the body as squatting and deadlifting are. 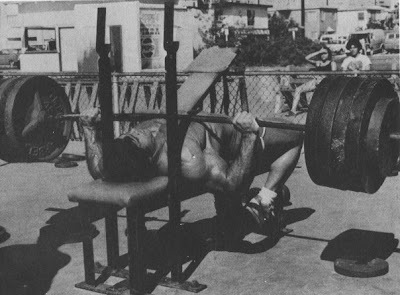 A beginner normally makes good progress in the bench, so he enjoys doing them. 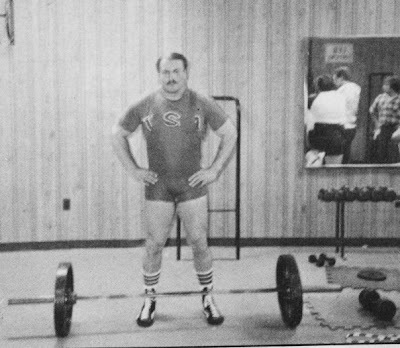 My old training partner and all-time great bench presser big Jim Williams calls the bench the people’s lift. Sine the bench is the most widely practiced lift it is also the one that generates the most questions. How can I improve my bench? Everyone has a theory or method for improvement. The truth is there is no universal answer. We are all individuals and have individual needs. What works for one person may not work for another. Similarly, different body structures allow some individuals to have better leverages than others. These better leverages allow one person to become much more proficient than another despite the fact that they follow the same routine. But even if you do not have the greatest of leverages for bench pressing you can still make good progress. Assistance exercises help many individuals improve even though their natural leverage is not the best. Bench assistance work is composed of many exercises that involve a wide variety of muscle groups. Prime considerations, though, has to be given the chest, shoulders and triceps as they are the main muscles involved in the lift. Of course, the biceps of the upper arm and the latissimus dorsi in the back also contribute substantially. These muscle groups should not be ignored either if a bench assistance program is to be comprehensive and effective. I feel it is a mistake to shortchange yourself by performing only the lift itself. In order to apply different assistance exercises most effectively, the bench press should be broken down into different sections. The first section involves lowering the bar to the chest, where the biceps and lats control the descent of the bar . . . a very important part of benching as the descent sets up the initial drive off the chest. If the descent is not good, chances are performance of the lift will suffer. The second section is pressing the bar from the chest to midpoint, where the pectorals and lats initiate the drive. The third part is from midpoint to lockout. Here is where the deltoids and triceps take the bar to lockout and completion. In order to be a successful bench presser attention must be paid to all of these areas. Your assistance program should be tailored to work all these areas, with special attention being paid to your weakest segment. You should not use an assistance exercise just because you saw someone else do it, or because your favorite lifter uses it. You must be honest with yourself and determine where your weaknesses are and go about correcting them. Consult your coach if you have one, or your training partners as other opinions can be valuable. It is sometimes easier for others to determine where your weaknesses lie. Bent Arm Pullover – The bent arm pullover differs from all other conventional lat exercises because it imparts a different pulling range to the lats. Most lat exercises are the pull-up, pulldown or rowing type. Bent arm pullovers offer stimulation to muscle fibers previously unworked. Even more importantly, it is the only lat exercise performed in a manner most closely resembling the bench press. Recommended reps – 6 sets by 6 reps done heavy. Lat Bar Row, Dumbell Row, Pulldown, Pullup – These are lat exercises of the more conventional form. They are all good movements for building size and strength. Recommended reps – Lat Bar Row – 4 x 6. Dumbell Row – 4 x 8. Pullups, Pulldowns – 3 x 8. Standing Curl, Dumbell Curl. Swing Bar Curl, Incline Dumbell Curl, Close Grip Curl – All biceps exercises help the bench by imparting a braking and controlling effect to the bar as it is lowered to the chest. Tow curling exercises should be worked together so more complete development is attained. Recommended reps – all curling movements 3 x 6 using heavy weights and good form. Incline Dumbell Press – This is a good upper pec developer, which should be done two ways for more complete development: with the palms facing forward, and with the palms facing each other. While this is a very good assistance exercise, the major drawback is getting the heavy dumbells into position. Recommended reps – 4 x 6. Lying Dumbell Press – This exercise works the chest more like the regular bench press. Just as in the inline dumbell press, lying dumbell presses help correct uneven extension in the bench press. Again, do the movement with palms facing forward, and facing each other. Flyes – All variations offer very good pectoral exercise. Start light to avoid injury and gradually work into heavy weights. Recommended reps – Flat, Incline, Decline – 4 x 6-8. Side, Front, Rear Deltoid Raise – Here are three shoulder exercises that should be worked during your entire lifting career and are best done with a weight that permits 12 to 15 reps for 2 or 3 sets. Fewer shoulder injuries would occur if the entire shoulder was toughened up with these three movements. The front raise can be worked heavier with lower reps since it is an anterior deltoid developer which helps in the finishing portion of the bench press. Recommended reps – side and rear deltoid raise – 3 x 15, front deltoid raise – 4 x 6 heavy. Behind The Neck Press – Can be done either standing or seated, Use heavy weights and good form. High Incline Bench With Barbell – A number of outstanding bench pressers have used this exercise. You can eventually handle some heavy weights in this exercise. Recommended reps – 3 x 8. Close Grip Bench Press – This exercise is one of the best assistance exercises for developing strong lockout power, as well as for building muscular bulk in the triceps. Hands should be kept 8 to 10 inches apart. Triceps Pushdowns – Use as heavy a weight as possible without sacrificing good form. Dips With Weight – Works both the chest and triceps. Recommended reps – 3 x 6-8. Lying Triceps Extension – One of the best bench press assistance exercises. Begin this exercise the same day you take up the sport of powerlifting and stay with it while working up to very heavy weights with small but regular increases in poundage. Maintain moderate form all the time. Lying triceps extensions build lockout power and help the entire bench press from start to finish. Some of the all-time great bench pressers have relied heavily on the exercise. Recommended reps – 5 x 5. Long Pause Bench Press - Makes the bench press more difficult by removing the assistance received from the small bounce between each rep. The pause bench teaches good form and builds strong off-the-chest power. Recommended reps – can be worked into the regular bench routine anytime. Do only 3 pauses per workout, with the duration of each pause lasting between 3 and 5 seconds. Bench Press Isometric Work – The lifter determines his or her sticking point and adjusts the power rack pins to that level. An isometric push is done for 10 seconds duration and repeated one more time. Do not hold your breath the entire 10 seconds. Lockouts – Lockouts are done in the power rack, pressing the bar from the pins to lockout, usually a distance of 4 to 6 inches. Start with a poundage slightly below your best bench press and add weight often, working up to very heavy poundages once per week. Recommended reps – Warmup 2 x 5, workout 3 x 3. Recommended reps – 3 x 3 once a week. 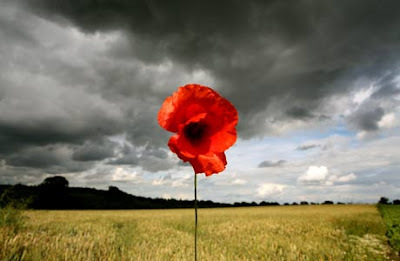 The preceding are the assistance exercises that I feel offer the best results. What you must now do is determine which ones suit your needs. If, for example, your weak point is your lockout, you would want to pick exercises that will develop the deltoids and triceps. I would use side, front, and rear lateral raises and close grip bench presses. On the other hand, if close grip benches are not for you, lockouts may be the answer. By finding your own current weak spot and referring to the explanation of the three main sections of the bench press, you can determine which assistance exercises will be of use. In selecting assistance work, quality not quantity is needed. Pick the exercises you need, do the required sets and reps and reap the benefits. Adding too large a number of exercises or too high a number of sets can be counterproductive. Do your assistance work after your regular bench presses, which I recommend you limit to practicing no more than twice per week. Do your assistance work for a 3 to 6 month period. During this time your actual bench press may drop, but don’t become discouraged. Assistance work is a long term investment and the results may take months to show up. Drop your assistance work 60 to 90 days before you compete. It is during this period that the results of your labor will become evident.